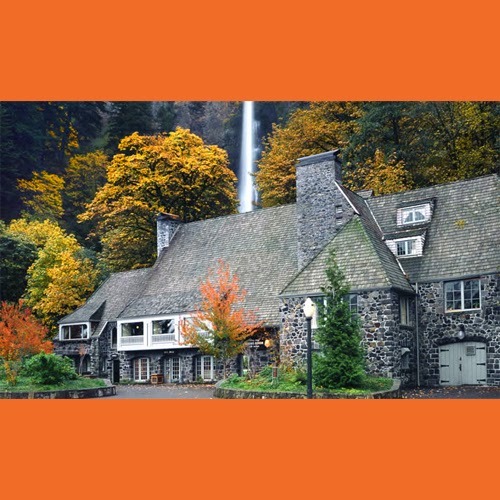 The Multnomah Falls Lodge is a must-see for anyone traveling through Oregon. This amazing location hold many treasures aside from this beautiful lodge including the upscale Northwest style restaurant, the mighty waterfalls, hiking trails and the educational Visitor Center. Learn details about the wonderful waterfall that is the Multnomah Falls below. Multnomah Falls plummets 620 feet in two major steps. The upper fall plunging 542 feet the lower fall 69 feet distinguishing Multnomah Falls as the highest waterfall in the state of Oregon and second highest in the nation. The water flowing over Multnomah Falls water is supplied by natural underground springs that originate on Larch Mountain. In springtime, snowmelt additionally supplies the falls, greatly increasing the flow, width and intensity of the falls' powerful roaring sound. Multnomah Falls offers one of the best places in the Columbia River Gorge to observe the geology exposed by floods over the centuries. The waters of the Missoula Floods enhanced the cliff and face of Multnomah Falls thousands of years ago when water eroded away the soft material, highlighting the cliff face. Five different flows of basalt of the Columbia River basalt group are visible in the face of the upper falls. Five additional flows of Columbia River basalt can be observed along Multnomah Creek from the trail above the falls. Multnomah Falls formed in two drops because of the more easily eroded zone at the base of the upper falls Lumber baron and philanthropist, Simon Benson donated the land that the falls sat upon, and funding for construction of the Benson Bridge. The bridge, constructed in 1914, allows visitors to cross over the lower falls and continue their paved trail journey to the viewing platform at the top. The platform offers dynamic views of the waterfall, Multnomah Falls Lodge, grounds, and the Columbia River Gorge. Benson also donated additional land that included Wahkeena Falls to the West.